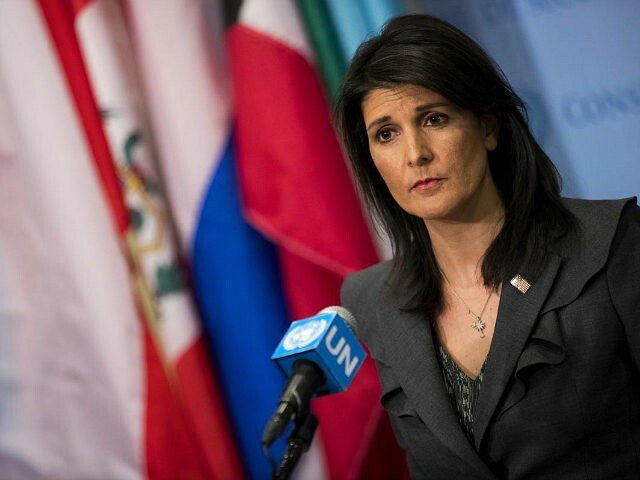 A New York Times headline attacks UN Ambassador Nikki Haley’s extravagant curtains, even though the Obama administration ordered them in 2016. The Obama administration ordered those $52,701 curtains. What’s more the Obama administration chose the $58,000 per month penthouse. Nevertheless, the anti-Trump Times twice more dishonestly describes the curtains as “Ms. Haley’s curtains” and goes on to compare them unfavorably to other reports of government excess while lamenting the cutting of State Department staffers — even though the cutting of personnel is the most efficient way to save taxpayer money and is usually where most of the bloat can be found. Some will argue this is not fake news because the Times does finally report the truth in the sixth paragraph. This defense cannot hold water in a business where everyone knows the headline is the story. If the Times did not want to make it sound as though Haley is the extravagant one, if the Times wanted to do a story on State Department “extravagance,” it could have done so with an honest headline, as opposed to one deliberately intended to mislead readers. This is why Americans mistrust the establishment media. Even though the facts lay every penny of this extravagance on the Obama administration, it is the Trump White House that gets the punished. This is classic bias, classic fake news, and the norm when it comes to Republicans, as opposed to the exception.